There are few things in life that stress me out more than choosing a restaurant (a fridge full of fresh– aka soon to be not fresh — vegetables would definitely be in the running). Ask me what country I want to visit next, if I want to quit my grown-up job to go frolic (ahem, teach) in Spain or what I want to do with my life and I’ll give little pause. But ask me where I want to go for lunch in a new city and I’m thrown into a tailspin of questions that can’t possibly be sufficiently answered by glancing at a menu outside. I’ll wander for an hour hoping to stumble upon the perfect equilibrium between hole-in-the-wall authentic but not too dingy and modernly elegant but not too pricey. I’m intrinsically driven to try new things, but there are times when, especially after living in a city for a few months, I’m just in the mood for a place I can count on to be delicious, friendly and comfortably fabulous. Sometimes, I just need some stress-free food. My first stop on every trip back to Austin: a Trudy’s Mexican Martini! In my hometown of New Braunfels my tried and true go-to is Gruene River Grill (rustic, riverfront, ridiculously delicious Italian margaritas and shrimp wontons). Austin has two go-tos, one for breakfast (Juan in a Million, obvs.) and one for drinks (Trudy’s, someone dame una Mexican Martini por favor!). In Sevilla it was El Tren for coffee (hello free, dependable wifi) and Marcos for dinner (bowl-licking Italian in an ancient arched setting). 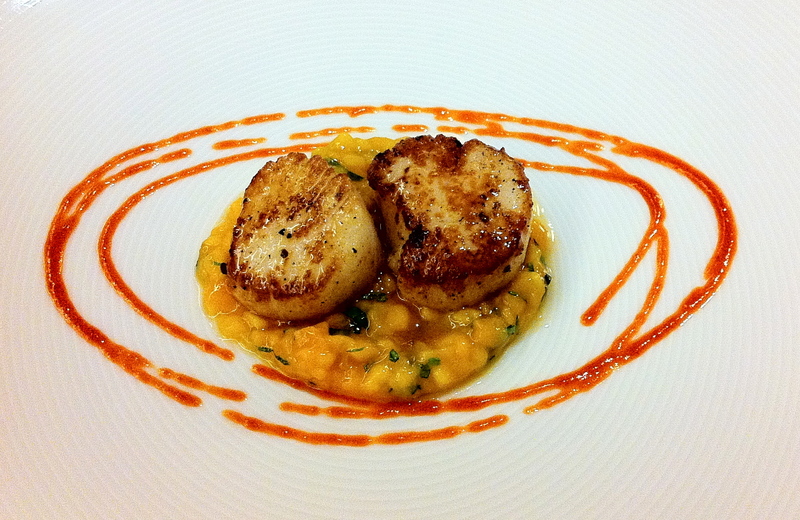 And in D.C., the candyland of restaurants? Tryst (scrumptious, reasonable, unassuming, close to home and everything I’ve ever wanted in a coffeehouse). Since unpacking in Sarria I’ve been on the hunt for the perfect sitio to add to my go-tos. The title is a tricky one to bestow. It must be delicious without being pretentious, comfortable without being drab and friendly without being pesky. Turns out, my stress-free eatery was one of the first restaurants I tested out in my little Northern pueblo: Matias Locanda Italiana. 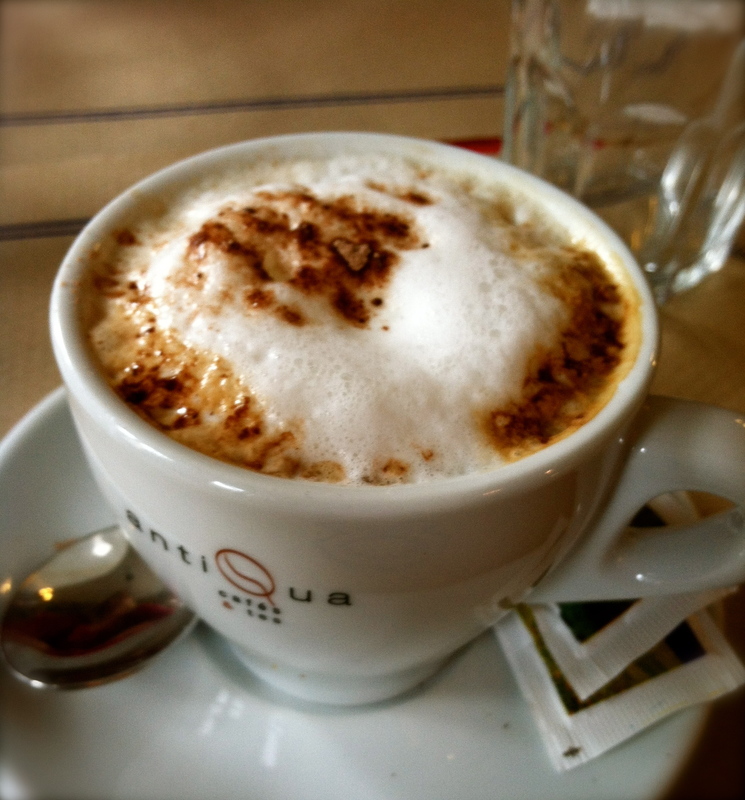 One sip of a Matias cappuccino and I was enamorado. One bite of their homemade brick oven-baked pizza and it became my new gold standard of thin crust. The ethically Italian, functionally world citizen, trilingual owner is charming, inviting and hilarious. He takes care of his regulars and has no qualms with me taking up the corner table with hours of typing and free-wifi browsing while savoring nothing more than one of his spectacular coffee creations. Nestled amid albergues and touristy tapas joints, Matias brings authenticity to the old part of town that usually bustles with pilgrims stopping off for a bite along the Camino de Santiago. 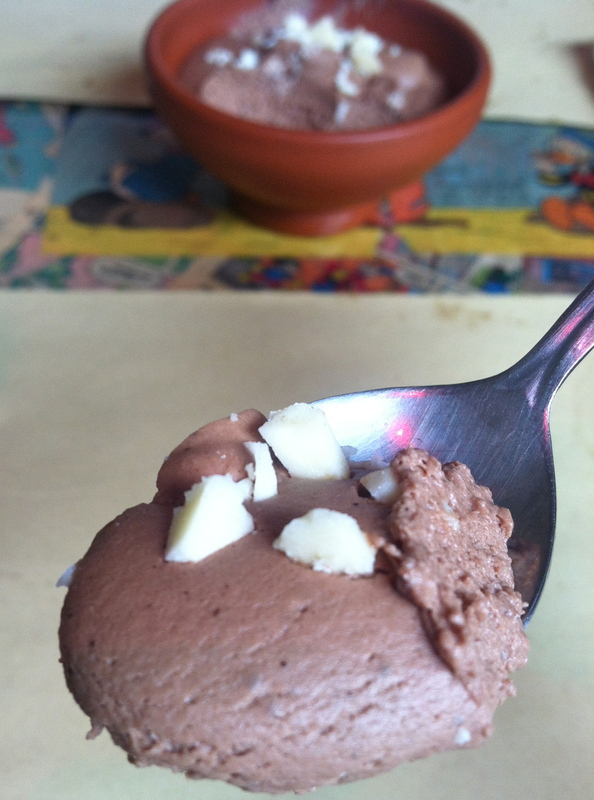 It’s the beacon of deliciousness at the top of a seriously steep hill, one I’m more than willing to climb for a scoop of their chocolate mousse (who needs a novio when you have this sinful mousse, Mr. Matias informed us during our last visit). Sarria may be known for it’s pulpo, but it’s these Italian plates of joy that drag me away from my estufa amid the rain and wind of Sarria’s wintery Spring. What is your go-to restaurant? How did you discover it? 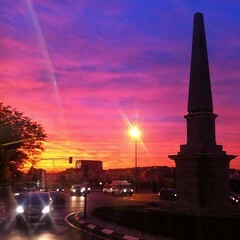 Living in Spain is amazing. 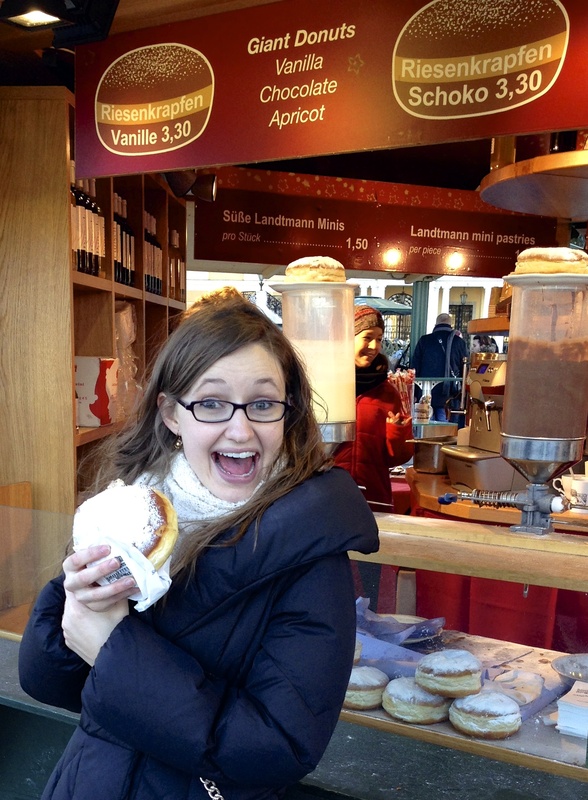 But sharing all the wonders of this glorious country with a first-time visitor, now that is truly joyous. When one of my oldest friends, Andrew, said he could make a four-day pit stop in Madrid on the front end of his Spanish work trip, I was — to say the least– ecstatic. As this would be Andrew’s first time in my pais de maravillas I was determined to enlighten him on all of the reasons why I feel in love with Spain in the first place. Somewhere near the top of that list: tapas! 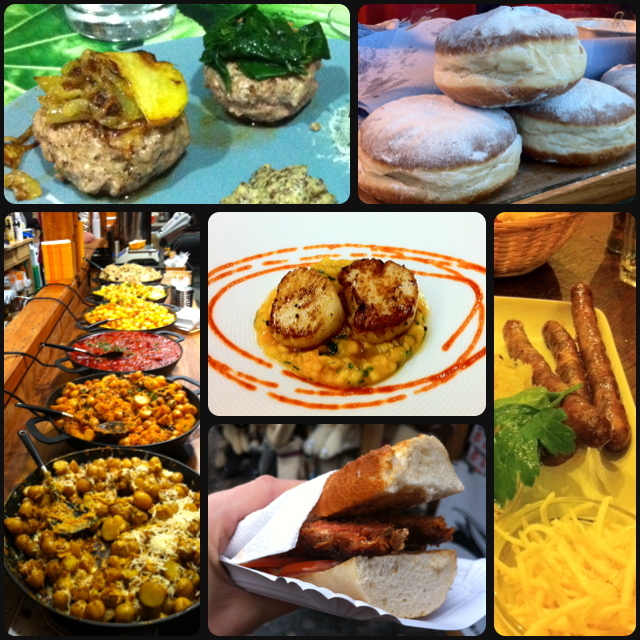 Within hours of being reunited at Barajas’ T4, Andrew and I were on the hunt for Madrid’s top tapas. Andrew and I embarking a three-night tapas spree. Google translate tells me “tapas” in English means “finger food” or “savories” but both of those words seriously underestimate both the scope and the vibrance of Spanish tapas. At it’s most basic level, a tapa is a size of a dish. They are always small, about the size you create by touching your two forefingers and thumbs together to make a circle. But more importantly, tapas are meant to be shared. 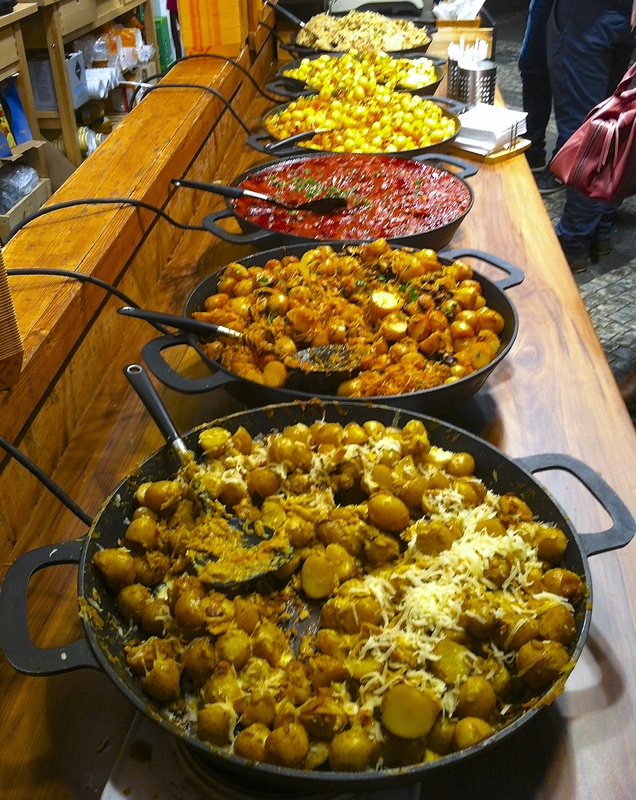 Going for tapas is as much about tasting a smorgasbord of scrumptious food as it is about socializing. In Spain, evenings revolve around going out to the calle, reconnecting with old friends, striking up conversations with new ones and soaking in the vibrance, beauty and life of the city. 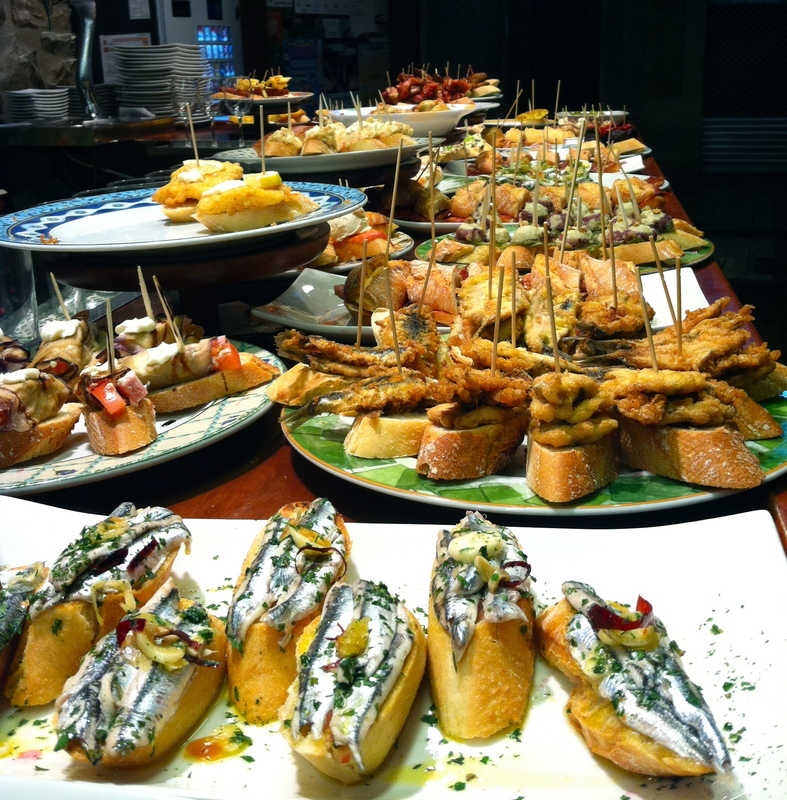 Tapas are the method (you could even say the excuse) for meeting and mingling. And with heavenly options like croquetas and jamón on the menu, there are few things in life I love more than an evening of tapas. 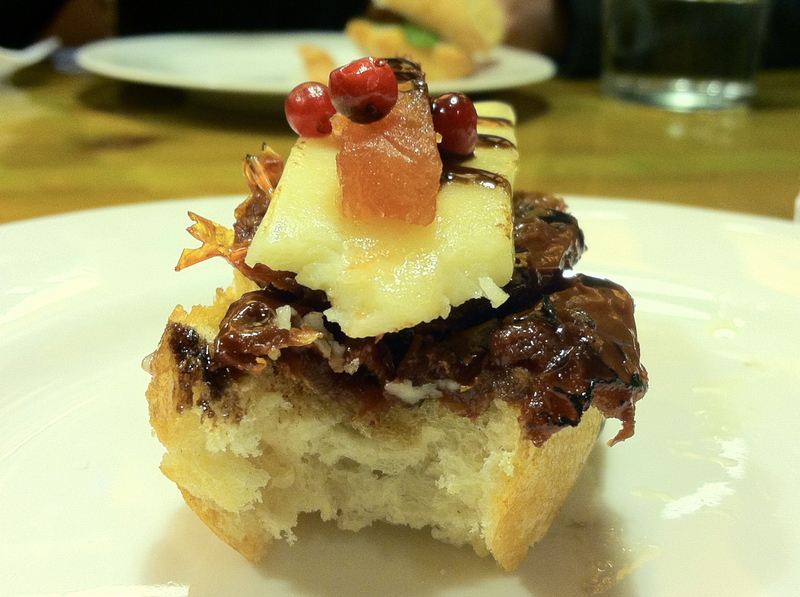 So without further pontificating, here are the top 6 tapas we fell in love with in Madrid. These “broken eggs” and chorizo served over fried potatoes were so good I had to go back to the Zapateria twice last time I was in Madrid! My notoriously bad Spanish is to blame for Andrew and I discovering this new gem of a tapa at La Zapateria. While I intended to order us some of my favorite huevos rotos con chorizo (directly translated: broken eggs with sausage which come served over Spanish-style french fries), I instead ordered us patatas caseras con morcilla (homemade potatoes with blood sausage). Luckily, it was still delicious! Large medallions of blood sausage, which was hearty tasting with a speckling of rice inside, were nestled among perfectly cooked potatoes drenched in an array of red spices. I was apparently too intent on devouring this new dish (and the perfectly delicious pitcher of Sangria) to snap a picture of it (so unlike me!). Pictured above are the huevos rotos that made me fall in love with La Zapateria the first time I came to Madrid in 2010. 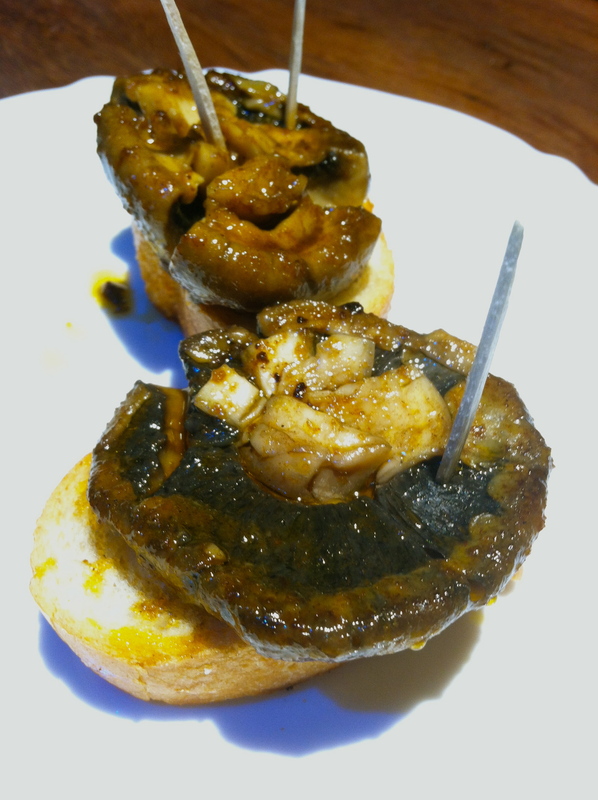 This cozy hole-in-the-wall style tapas bar is also where I was first introduced to the tastiness that is caracoles, aka snails! Fried potatoes with fried egg and bits of jamón from El Almendro in Madrid. El Almendro is nestled slightly off the beaten path in the La Latina district of Madrid, the oldest part of the city. Inside, the first floor of the restaurant is dedicated solely to tapas-goers. It’s an order-at-the-bar style affair where the bartender was extremely patient while helping me decide between the fruity, semi-dry or dry white wine (I’d DEFINITELY go with the dry). The huevos rotos (a Madrid specialty, if you hadn’t noticed yet) at El Almendro came highly recommended by a friend who used to live in Madrid and they were absolutely not a let down. This restaurant takes their own spin on the traditional dish, serving it with chip-style potatoes instead of the usual french fry style. While I prefer the more chunky potatoes, the chips made it much more of a finger food, which lightened the atmosphere and turned into a fun evening of catching up and chowing down! 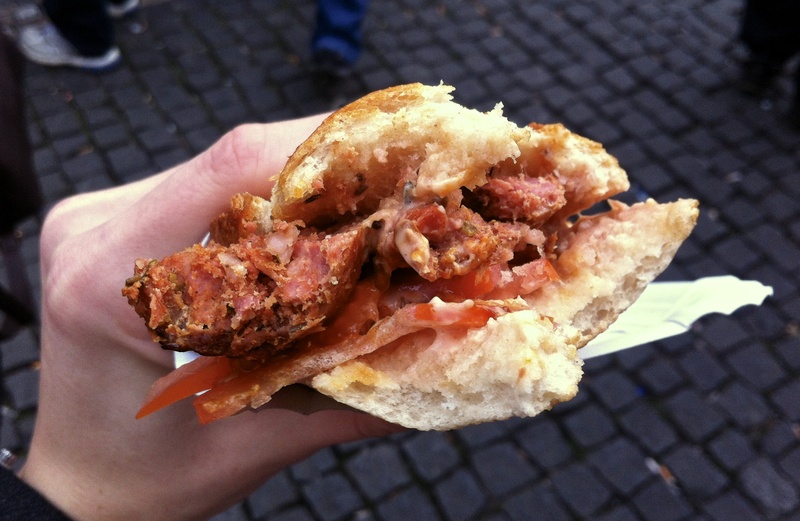 Where to find the deliciousness: Calle Almendro, 13 in the La Latina district. One of my favorite tapas: croquetas! La Pasa serves theirs as round balls, rather than the traditional log shape. Croquetas being one of my all-time favorite tapas, I was stoked when a friend recommended La Pasa as the best place to grub on the best croquetas in Madrid. The vibe at La Pasa can only be described as a mezcla. The tables are glass, the walls are covered in modern-ish art and the best of the 2000s is playing at just the right loudness over the speakers (oh yeah they played Jack Johnson!). Being, as always, excruciatingly indecisive at ordering, we opted to get half boletus (a type of mushroom) and half seafood croquetas. Initially, I was surprised at how large these La Pasa croquetas were! Usually croquettes are about the size and shape of a thumb – long, skinny and small. These, on the other hand, were slightly larger than golf balls and perfectly round! One bite into these globos and I understood perfectly the reason behind their unusual shape. By making them round, La Pasa increased the amount of the gooey delicious filling you get in one bite while decreasing the amount of fried outer shell. The result was a mouthful of fantastic flavor with just a hint of that oh-so-familiar fried olive oil taste. Can you say delicious! These easily put my feeble attempt at homemade croquetas to shame. After a careful taste test, I have to recommend the boletus croquettes. They were muy suave and packed with flavor! Caramelized onion tortilla, meat-filled empanadilla and jamon tartas with a hefty cup of Tinto de Verano. Aka HEAVEN. Deciding which amazing Spanish tapa should be Andrew’s inaugural taste of Spanish food was obvious: the classic tortilla. And just as perfectly, a friend had recommended the perfect place to savor the best tortilla Madrid has to offer: Potente. This Latina-area bar not only has traditional Spanish tortilla (heaven in of itself) but has three or four specialty types of tortilla as well! We opted for the caramelized onion version over one with mushrooms, one with chorizo and one with peppers. It was slightly sweeter than a normal tortilla but just as fantastic. While it may be seriously breeching Spanish traditionalism, I could definitely get down with tortilla innovationism. Yum! We paired this tortilla heaven with a carne empanadilla, or beef, potato and pea filled pocket of joy. 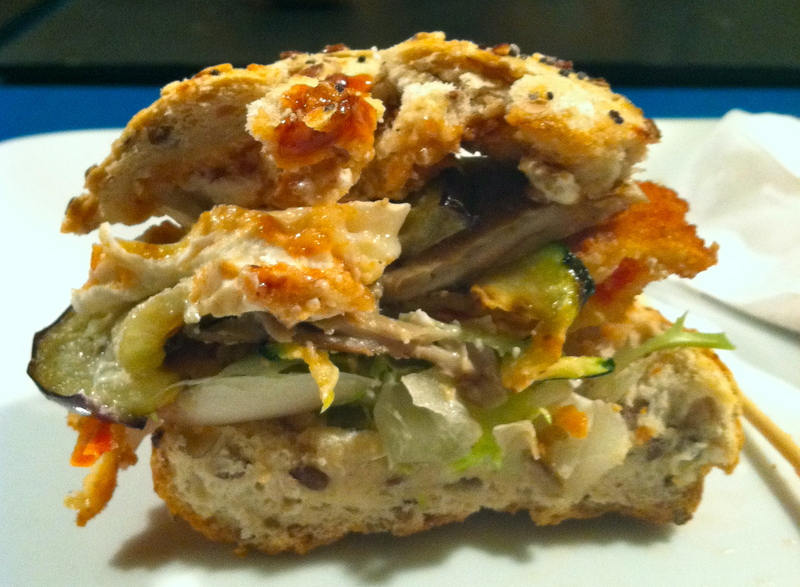 It was the perfect blend of sweet and savory wrapped in a breading that was neither too dense nor too flaky. Galicia needs to get some of these on their menus. I want more! My favorite food in my favorite place! A chocolate-filled croissant at La Mallorquina! The croissants in the napolitanas con chocolate at La Mallorquina somehow manage to find the sweet spot between too fluffy and too flat and bread-like. Unlike many napoltianas that have only a thin smattering of chocolate inside, this delicacy was equal parts chocolate and croissant. It was, without question, the second best napolitana con chocolate I have ever tasted (which is saying something considering my 5-month long goal of tasting every chocolate-filled croissant in Spain while I was studying here!) 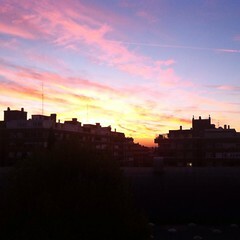 The best is, and always will be, from my horno in Sevilla…. This is, without doubt or question, the best huevos rotos you will ever eat. Thank you Lucio for creating happiness. 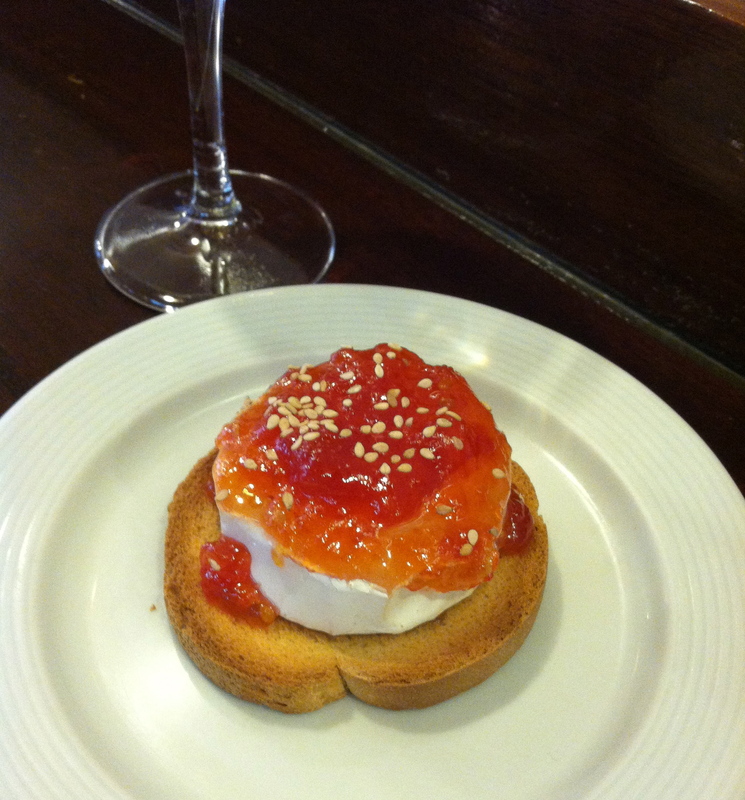 In poetic fashion, our last tapa before leaving Madrid was, without question, the most amazing. At least six Spaniards independently recommended I eat at Lucio’s while in Madrid. That recommendation was always followed by some version of “It is the best place in town!” “The king eats there!” “Bill Clinton ate there! !” Oh yeah, we had to eat there. So after a few unbelievably cheap Mahou cervezas (the beer of Madrid) we squeezed our way into a table at the back of this llena establishment. If we would have done as the true Spaniards do, we should have ordered our huevos rotos at the bar, along with a couple more cervezas, and parken in this perpetually stunning dance/balancing routine in which you have a beer in one hand, a purse and jacket precariously perched against a wall/wooden nook and a fork in the other hand. Then, the group passes around the plate and somehow the whole thing is devoured over a 30 minute time period all while talking, laughing jostling and drinking. 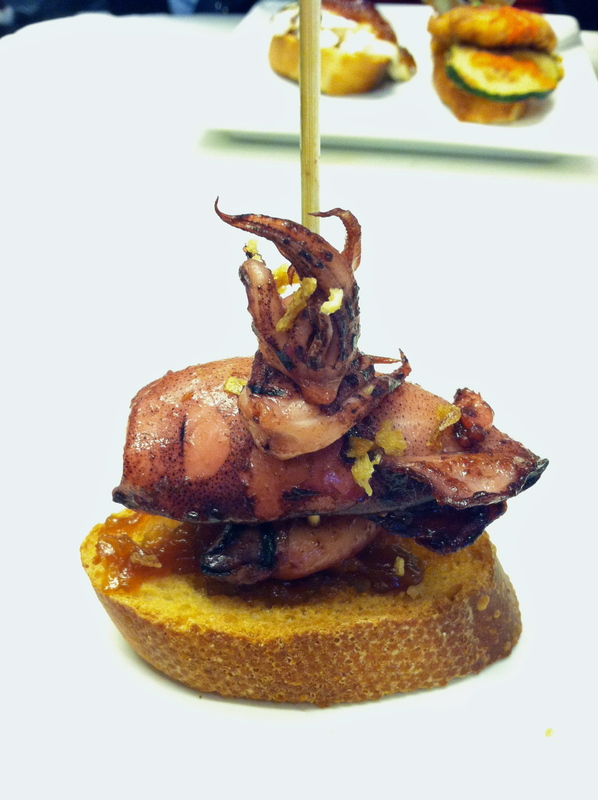 Spaniards are a truly gifted people when it comes to tapas. Instead, we took our huevos with a side of bread, a seat and glass bottle of water (the only way water comes in Spanish restaurants. Que fancy). They arrived with the smell of heaven: sausage pleasantly smokey and perfectly crispy, eggs fried to exact moment when the whites are solid but the yolks are ready drench a bed of freshly-cut, freshly-fried potatoes in a yellow bath of flavor. It’s official. I could eat huevos rotos every. single. day. 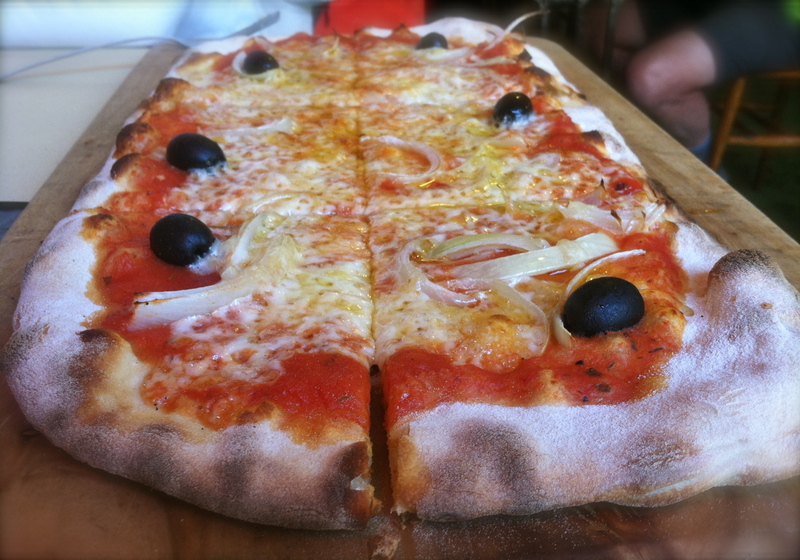 Where to find the deliciousness: There are two Lucio’s – one is the restaurant (the more expensive option) which is called Casa Lucio. 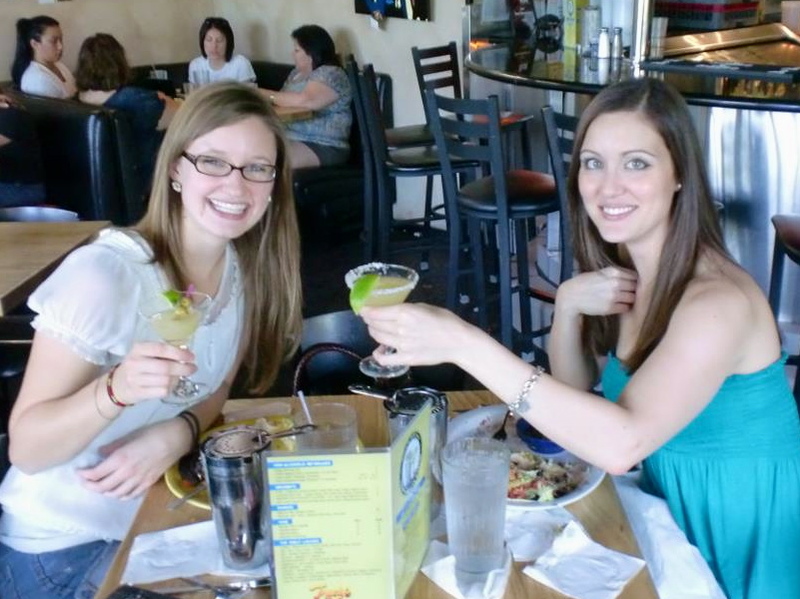 The other is across the street and is more for tapas, such as the joyousness pictured above. 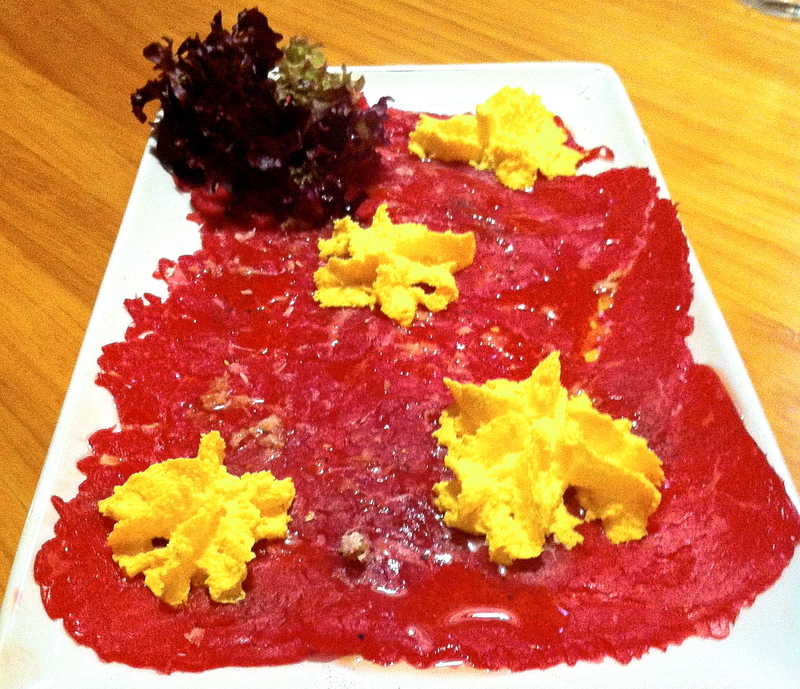 That one is called Taberna los Huevos de Lucio, which is located in La Latina district on calle Cava Baja, 30. My second, studied attempt at Spanish tortilla-making. Tortilla is to Spain what peanut butter and jelly is to America. 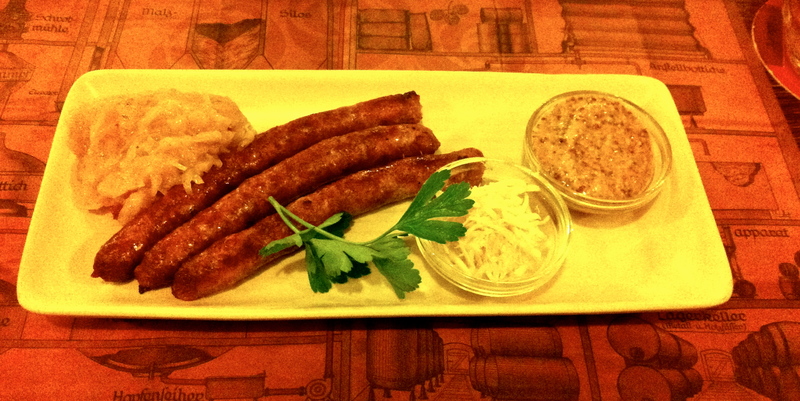 Don’t know what to have for dinner? Tortilla. Need to pack a lunch? Tortilla on bread. Looking for a mid-afternoon snack? Tortilla with toothpicks. It’s nearly impossible to find a tortilla-free tapas menu or Spanish madre who doesn’t have the perfect tortilla flip. Thus in my attempt to learn how to cook Spanish food, the most logical starting point was the oh-so-typical Spanish omelet. The seemingly-simple recipe has only three ingredients (four, if you’re rebellious): potato, egg, salt and onion (because I am). I have been assured by every Spaniard I’ve asked that, like all things in the Iberian Peninsula, making tortilla is muy facil. I’m beginning to think my basic Spanish classes failed to teach me the real definition of “facil” because this totally traditional dish is proving to be anything but easy to recreate. My first attempt at cooking tortilla was more than two years ago, days after returning to America after studying in Sevilla for five months. I can’t remember the specific ratio of potato to egg that I used, or exactly how burnt the exterior was, but it will suffice to say it tasting nothing like the omelet my señora used to serve. Don’t be fooled by my shoddy photo skills, this puck of egg and potato is straight up burnt. A year later, living in a group house in D.C. with a Spanish roommate, I attempted the facil three-ingredient dish again. THe second the Spaniard left the house, my solo tortillas lost their light and fluffiness, burned on the outside and were grossly runny on the inside. I blamed America’s must-be-refrigerated eggs. After landing back en España this year, tortilla was item No. 1 on my list of homemade dinners. But despite the farm fresh eggs and grown-in-Galicia potatoes, my Spanish omelet was just as dry, black and bland as ever. I was convinced that making tortilla is just not in my blood. 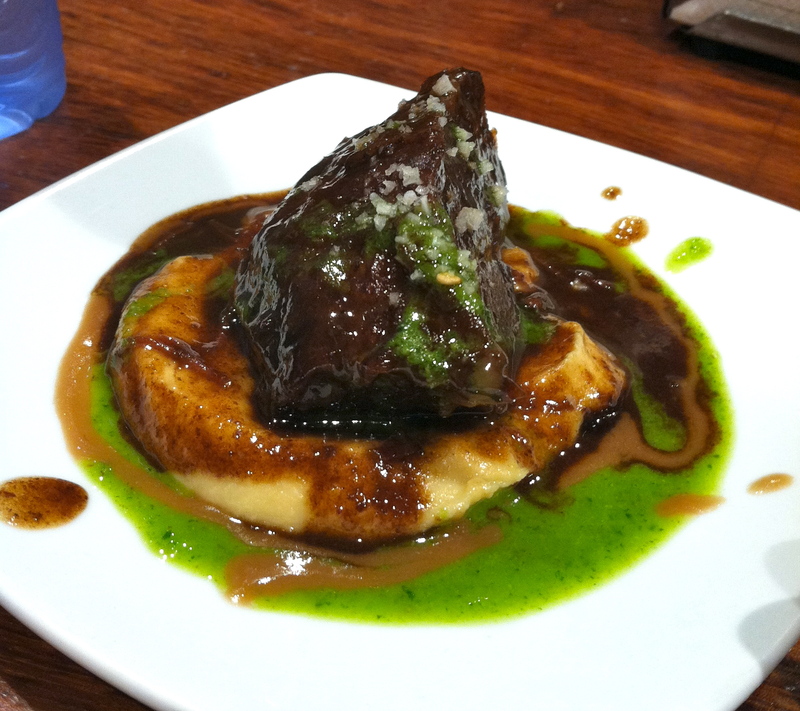 In order to successfully create this so-called facil dish, the chef had to be a full-blooded Spaniard. 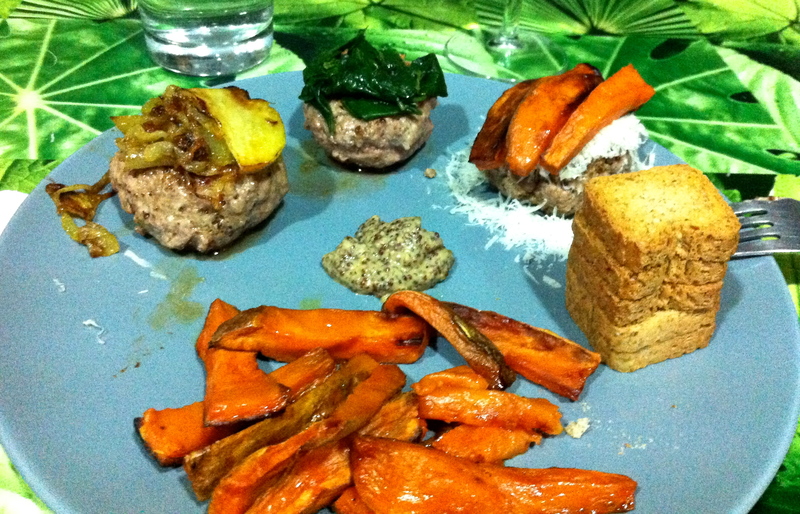 On the verge of giving up all hope of ever cooking like a Spaniard (after all, if I can’t pull of the most staple of Spanish dishes, how could I ever attempt the delicious meatballs or heavenly croquettes?) Not ready to give up on my fantasy of freshly-cooked Spanish delicacies, I solicited the help of every Spaniard I knew for tortilla-making advice. A teacher at school swore it was all about the pan, so I bought a new, non-stick skillet. A friend insisted the key was low heat, so I vowed to never use a full flame again. The best advice came in the form of a demonstration one night while having cena at a friend’s house. We arrived just in time to witness a true Spanish madre in tortilla-making action. I was a tad bit excited. 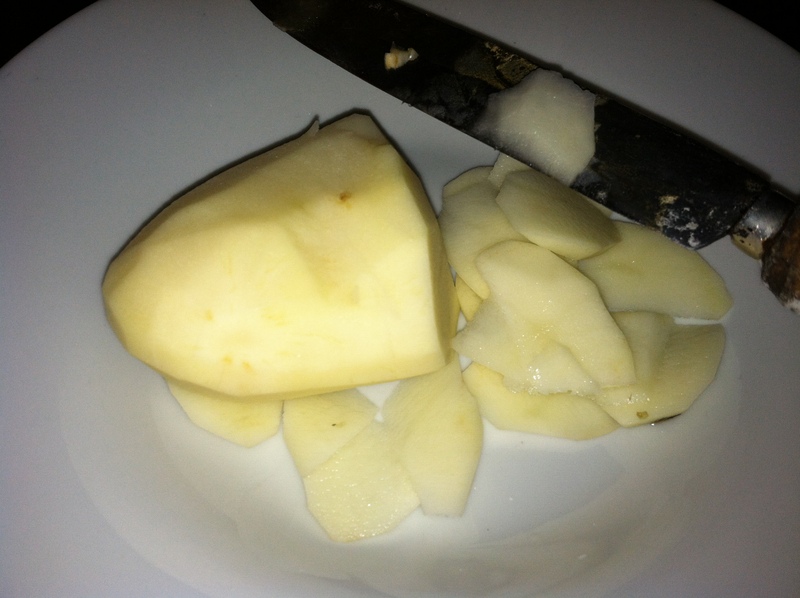 Mistake #1: The potato has to be thinly shaved, not diced. Mistake #2: The potato to egg ratio should be nearly even. Mine was always seriously skewed. The tortilla master (a title worn by all Spaniards, in my opinion) walked me through each step. Slide the masterpiece out onto a plate and go about your sweet Spanish life, cuz Dios! wasn’t that easy?!? 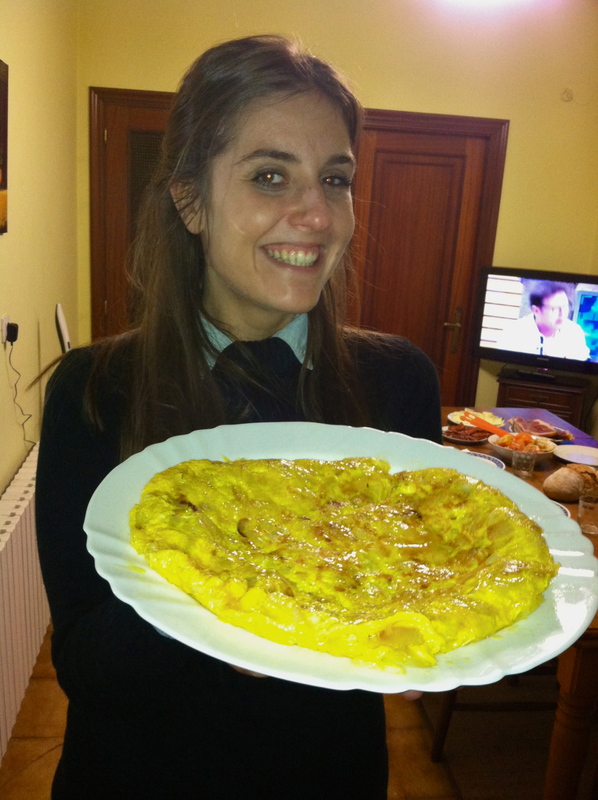 Myriam showing off her mother’s perfect Spanish tortilla. SIXTEEN steps. And she made it look SO easy! They say this is the easiest Spanish meal there is. I’m doomed. But I’m also determined. So after returning from my (completely fabulous) Christmas vacation in the states, I set out to re-create the magic I witnessed in Myriam’s kitchen. I chose two small and one large-ish potatoes and meticulously peeled them. 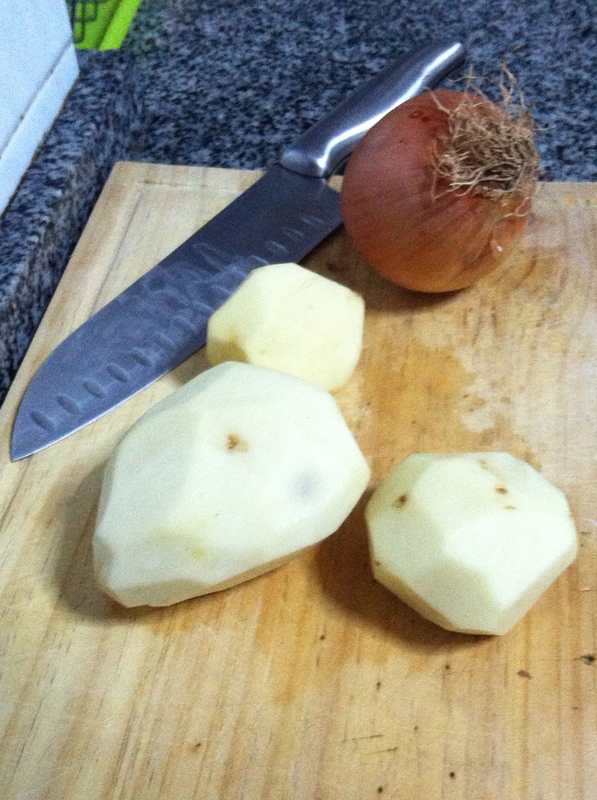 Second, I slivered the potatoes into thin pieces and minced the onion. Next, I dumped my cutting board handiwork into hot Extra Virgin Olive Oil until the potatoes and onion were soft and cooked through. 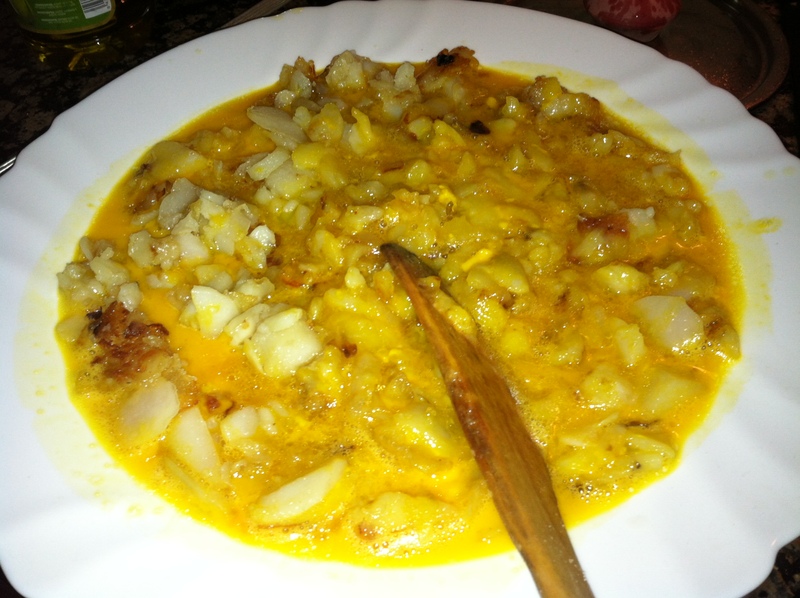 With three eggs scrambled and waiting, I spooned the lightly browned potatoes and onion into a bowl. Lastly I slipped the concoction into my tortilla skillet, flipped the forming omelet way before my instincts told me it was cooked and hoped for the best. While it still wasn’t a perfect Spanish omelet (I forgot the salt and could’ve had a tad more potato) it was definitely passable!